Lithium-ion batteries are one of the most popular rechargeable energy storage devices for portable electronics and electrical vehicles. In this presentation, I will show a method we developed for performing in-situ electron microscopy to track lithium transport and electrochemical reactions. Two examples will be given. One is on lithium conversion reaction in individual FeF2 particles. The other is on lithium diffusion in Ag or K doped MnO16 hollandite nanorods which exhibit intriguing 1D tunnel structure that can be manipulated for charge transfer. The microscopy investigations were integrated with bulk x-ray and electrochemical measurements a well as theoretical calculations at atomic scale based on DFT and meso scale based on phase-field theory. The role of the defects in the lithiation process will be discussed. 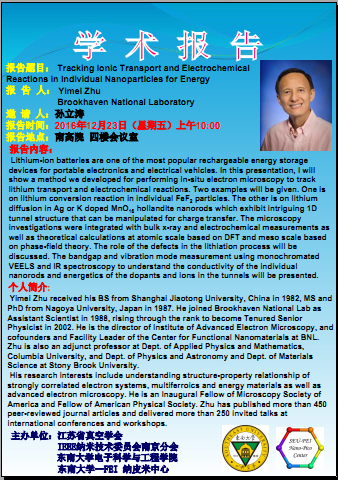 The bandgap and vibration mode measurement using monochromated VEELS and IR spectroscopy to understand the conductivity of the individual nanorods and energetics of the dopants and ions in the tunnels will be presented.